A couple of weeks ago on this blog page, I wrote an article about the early season snow conditions. As a Private Ski Instructor this is something I don't normally do, preferring to let various other websites specialise with these types of posts. However it seems that so far this winter the weather and snow conditions appear to be the most dominant subject at the moment, and quite rightly so. So if it's ok with you, I'll give you all another up front and honest report direct from Méribel. Before I start, I'd like say that all of the photos in this post have been taken in the last four days. So what are the conditions like leading up to the Christmas week? Before I answer this question, I think it is important to look at what has happened with the weather the last week or so. To be honest it has been very topsy-turvy with the weather all over the place. We have had sunny days, cloudy days, some lovely snowy days, followed by a rather annoying rainy day. But the most important influence has been the temperature. The last few weeks has on the whole, been on the mild side. And this been the dominating factor. This is Ruby who I skied with a few days ago, and we were stood not far from the Col de la Loze above Courchevel La Tania. 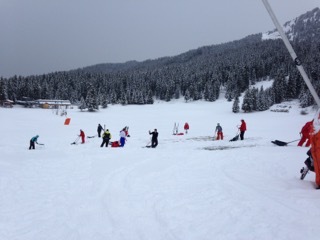 You can see that we were skiing on a thin layer of fresh snow here, which was gorgeous to ski on. A couple of times this week we have been on the receiving end of welcome precipitaion, with it falling as dry snow on the higher slopes, and unfortuntaley some of the snow has turned to rain down at resort level. 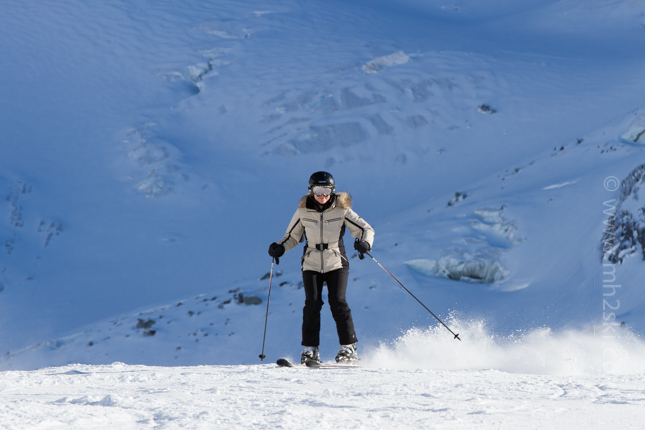 This is Ruby again, skiing in and out of the cloud. 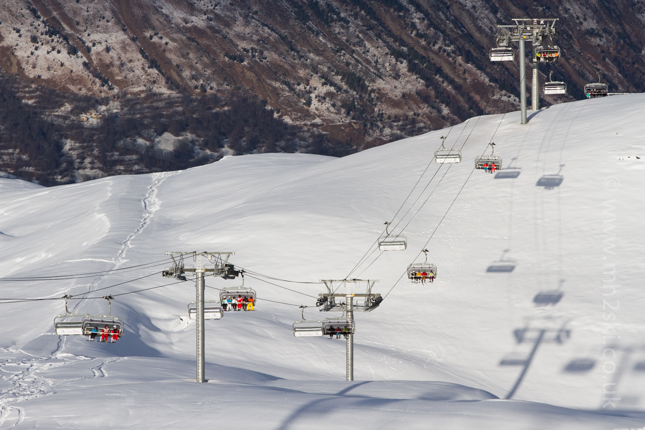 This means that the upper pistes are in way better condition than the lower pistes. 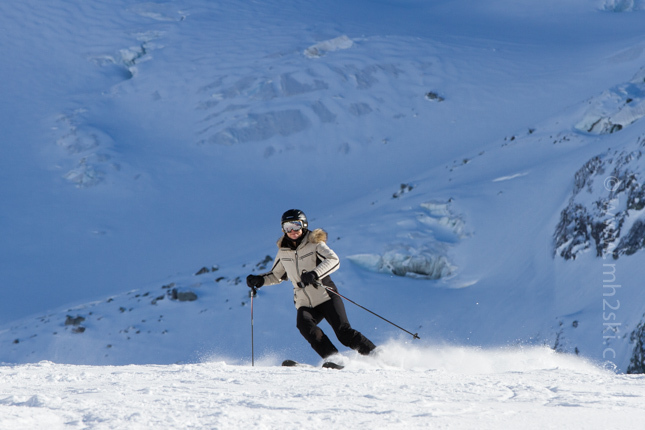 The milder temperatures have melted some snow from previous snowfalls on the lower pistes, and with few days and nights at sub zero temperatures, the snowmaking has had a limited chance of producing man-made snow. The upper slopes however have had a better chance of keeping the natural snow that has fallen. And at this higher altitude the colder temperatures enable the snow cannons to blast away when it is cold enough. One respectable and reliable source for finding out up-to-date snow conditions is the Merinet website. One of Merinet's main contributers is a wonderful Lady called Caroline, and a few days ago she published an eloquent report that ended like this... "What we need now is a cold snap which will allow the snow cannons to run day and night. Or a ruddy great dump of snow. Or preferably both. 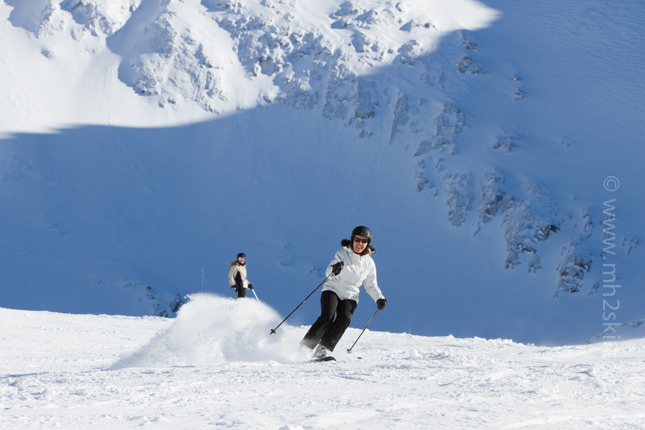 Until then, there's plenty of skiing to be done on the upper runs." And I couldn't agree more, the upper runs that are snow cannoned are perfectly skiable. With this in mind, and in preparation for next weeks all important Christmas period, I went for a recce today around the mountain to gain further knowledge of the conditions. Oh, and along came with me Caroline (of ruddy Merinet fame), and her wonderful friend Maria. Here are just a few photos I took of them this morning. 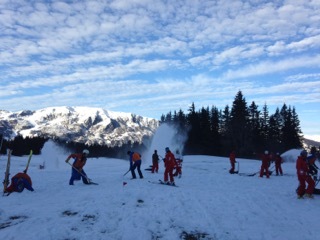 As you can see we had some lovely weather today, and found some nice snow on the upper slopes. Selfishly I won't let the world know where these pistes were, I'd like to keep this knowledge up my sleeve for next week. 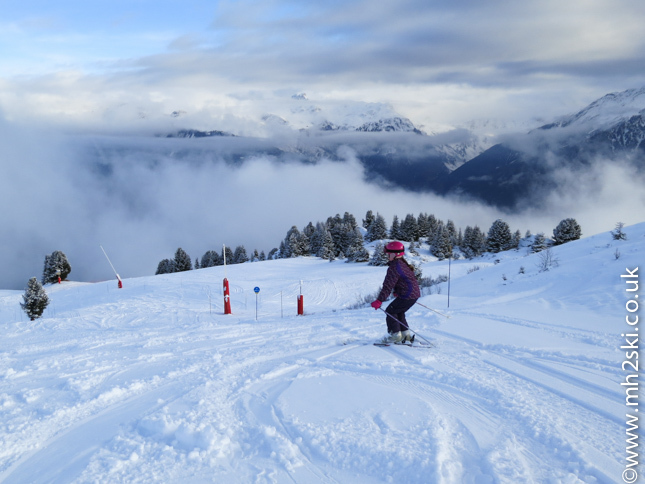 However the three of us came up with a made up name for this piste, we called it 'Machin Truc', which translates as 'Thingamabob'! But what about the lower slopes? I am utterly impressed with how the resort is able to open up some of them. Remember how the climatic conditions have thrown a spanner in the works with the mildness. It is possible to ski down to Meribel at the moment, and also of course possible to download on lifts for those that choose to do so. Whenever it has been cold enough the cannons have pumped out snow, and then moved around by the bashers. This has been a challenge for the resort, but every day has shown improvements in time for next week. 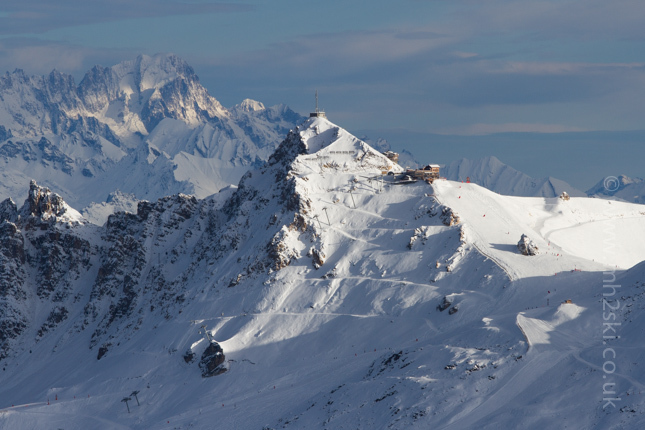 One incredibly vital area of Méribel's success as a ski resort is the beginner and lower intermediate terrain. One main area of this is the Altiport sector, or specifically named as Blanchot. A couple of days ago the resort put out a request for volunteers to help to give them a chance of opening this area at the weekend. Michael boldly volunteered and has been valiantly working away up there the last two days. He took these photos to give you an idea of what efforts he and about sixty other volunteers have made. It was requested that volunteers took along shovels, rakes, tarpaulin and even quad bikes. 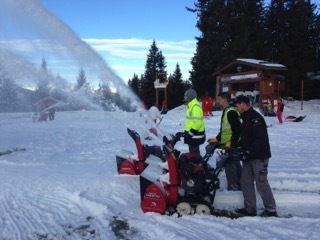 In fact snow blowers (the ones used to clear snowy driveways and restaurant terraces) were used effectively to blow snow into a concentrated area that will help create a piste from nothing. I hope this gives you an idea into how much work has gone into opening as many slopes as possible for this weekend. The effort of Michael and the other sixty volunteers, the highly capable snow making system, the pisteurs and the piste basher pilots will have definately had an affect. This all sounds quite dramatic doesn't it? But I know for a fact that many many ski resorts (in France and other alpine countries) will be unable to open and operate this week due to a number of reasons. 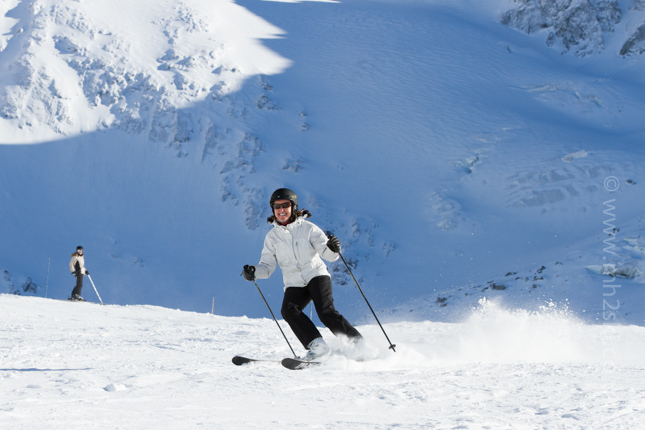 However Méribel, Courchevel, St Martin, Les Menuires and Val Thorens are at least in a position to be able to offer skiing to visitors. Granted not quite as much as normal, but at least we have choices. In the meantime, please pray to the Snow and Weather Gods, to help us all during the Festive Period. I hope you found this article interesting. 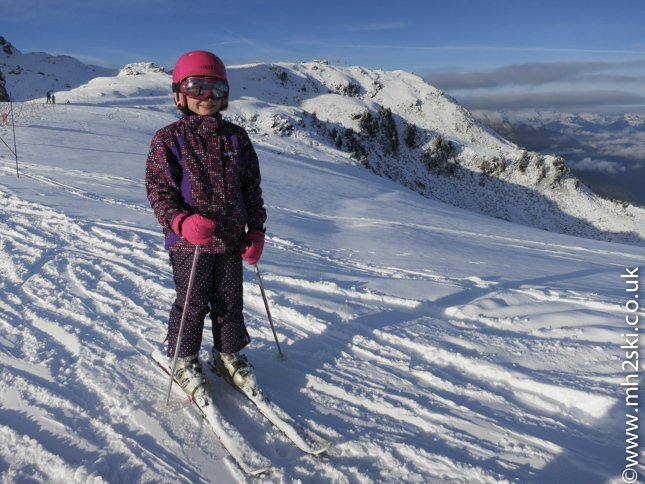 If you are travelling out to the Alps soon with children, you might be interested in an article I wrote a while ago titled 'Children Learning To Ski', click here for the link. Feel free to share away on Facebook, Twitter and Google+ using the social media icons. Or please leave a comment below. Martin.